Scandinavien bis zum Frieden von Friedrichshamm 1809. Mit Angabe der, bis zur neuesten Zeit merkwuerdig gewordenen Orte. 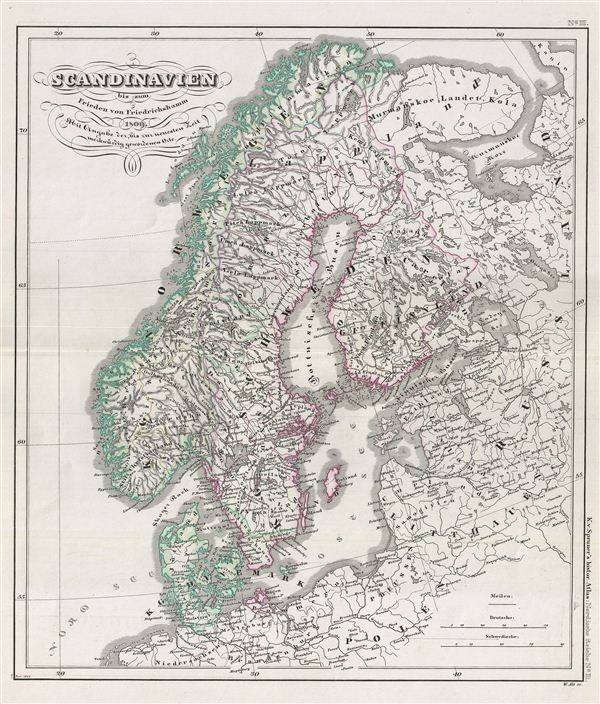 This is Karl von Spruner's 1854 historical map of Scandinavia just prior to the Treaty of Fredrikshamn. The map covers Sweden, Norway, Denmark and Finland and includes parts of Russia. On September 17, 1809, Sweden and the Russian empire signed the Treaty of Fredrikshamn, a peace agreement that concluded the Finnish War. Under the Treaty of Fredrikshamn Sweden ceded Finland and parts of the province of Laponia and the Aland Islands to Russia. These territories were consolidated into the Grand Dutchy of Finland, part of the Russian empire until 1917. The whole is rendered in finely engraved detail exhibiting throughout the fine craftsmanship of the Perthes firm. Prepared by Karl Spruner for publication as plate no. III in the second edition of Justus Perthes' 1854 Historich-Geographischer, Hand-Atlas zur Geschichte der Staaten europa's vom Anfang des Mittelalters bis auf die Neueste Zeit.